William Dickerson was invited to join and was elected as the first Artist Member in 1931. The purpose of the organization was to help artists sell their work through collaborative shows throughout the country and by their Associate Member program. Associate Members (non-artists) payed a $5 membership fee. The primary benefit of their membership was that they were sent a Presentation Print each year. To some extent the Prairie Print Makers organization was modeled after the older and more established Chicago Society of Etchers. In fact, James Swann served as Secretary-Treasurer of the CSE before taking the same role in the PPM. Unlike the CSE that only allowed intaglio prints, the Prairie Print Makers realized that they needed to be more inclusive in their types of art by including woodcuts, lithographs and wood engravings in their Presentation Prints. Of the 34 Presentation Prints of the PPM, 9 were lithographs, 7 were etchings, 6 were drypoint, 1 was aquatint, 3 were wood engravings, 1 was a linoleum cut, 4 were a combination of etching and aquatint, 2 were color woodcuts and 1 was a combination of etching and drypoint. In other words 15 of the 34 prints would not have been eligible to be considered by the Chicago Society of Etchers. Although the Prairie Print Makers was more “modern” in its inclusion of different media than the Chicago Society of Etchers, both organizations saw a decrease in their support by the late 1940’s resulting in the closure of the CSE in the mid 1950’s and by the mid-1960’s the PPM had ceased operations. As the “representational” style of art promoted by both groups lost favor with the public and the art world, the interest level was not sufficient to retain Associate Members and retain the economic viability of the organizations. Note: The Spencer Art Museum has a full set of all Prairie Print Makers Presentation Prints on their website at www.spencerart.ku.edu. Each print is displayed with a brief description. The full set is also included in the excellent book: James Swann: In Quest of a Printmaker by Joseph S. Czestochowski (Cedar Rapids Museum of Art: 1990) which is used as the reference for this listing. Thank you for the information. My father’s mother was given Charles M. Capps etching “Be it Ever So Humble” in 1936 by the Ladies Society of the Hilltop Methodist Church in Wichita. 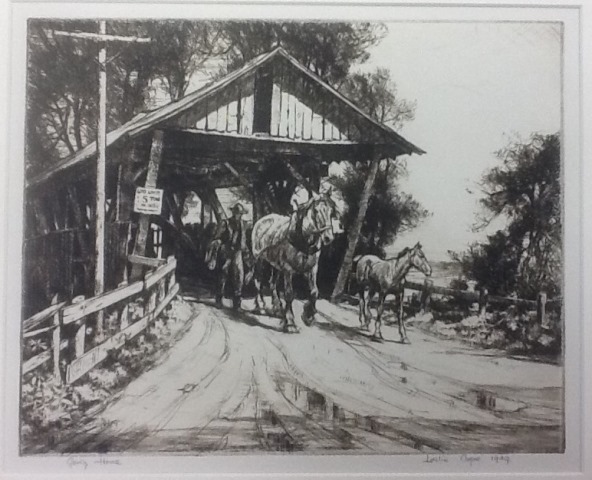 I found the framed etching which was signed by the artist in 1932. My grandfather attached Capps’ obituary which led me to want to find out more about him and The Prairie Printmakers. My father and his parents lived in Wichita for several years. Charles Capps was a very well regarded member of the Prairie Print Makers. His prints are desirable and continue to sell at a premium. I am sure you enjoy the work he gave to your Grandmother. 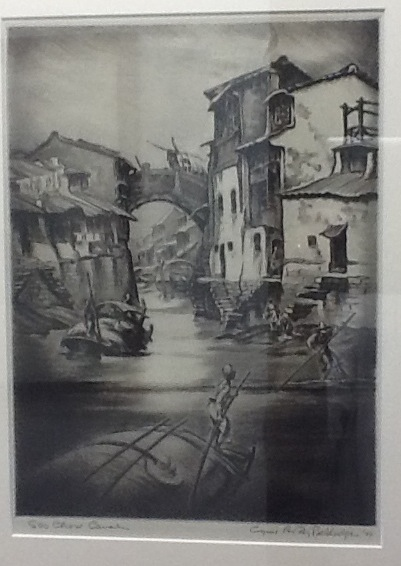 I found a Cyrus Leroy Baldridge etching, Soo Chow Canal signed 1944. I am not sure if we are related but enjoy his work. Baldridge was an excellent artist and I also enjoy his work. His life story is “Hemingway-like” in many ways. I plan to write about him in a future blog.